The August 13 meeting may finally yield a date for Moon Jae-in’s anticipated visit to Pyongyang. South Korea’s Ministry of Unification announced on August 8 that North and South Korea will hold high-level talks at Panmunjom on August 13. On August 8, North Korea requested to hold a meeting that will review the process of carrying out the Panmunjom Declaration and discuss issues surrounding the upcoming North-South summit. South Korea agreed to the North’s request. South Korea will organize a delegation with Cho Myung-kyun, minister of unification, as lead representative. This meeting will be the fourth of its kind this year, following similar meetings held on January 9, March 29, and June 1. The point of interest lies in whether the dates for a North-South summit will be finalized at this meeting. The Panmunjom Declaration explicitly mentions that South Korean President Moon Jae-in will “visit Pyongyang this fall” but no dates have been set. The last South Korean president to travel to Pyongyang was Roh Moo-hyun in 2007. Some experts have alluded to the possibility that the summit may be held as early as the end of this month, as negotiations for denuclearization and concluding a peace agreement between the United States and North Korea have reached a stalemate, and there is a pressing need to find a breakthrough somewhere. The meeting is expected to review the Panmunjom Declaration adopted on April 27, and discuss the way ahead. This may include scheduling the events suggested by Kim Jong Un, such as the “Autumn is coming” concert in Seoul — a sequel to the “Spring is coming” concert held last April in Pyongyang — and a joint basketball championship vowed to be held in Seoul this fall. 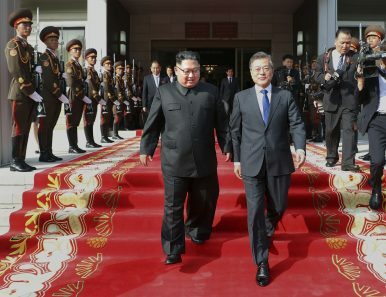 How Do South Koreans View a Possible Peace Treaty With North Korea?Date Set for the Next Step in Dialogue Between North and South KoreaWhat to Expect in Inter-Korean Relations in 2019Achieving Peace on the Korean PeninsulaHow Much Do the Panmunjom Agreements Matter?